UpSpring’s All-Natural Probiotic Drops Now Available! 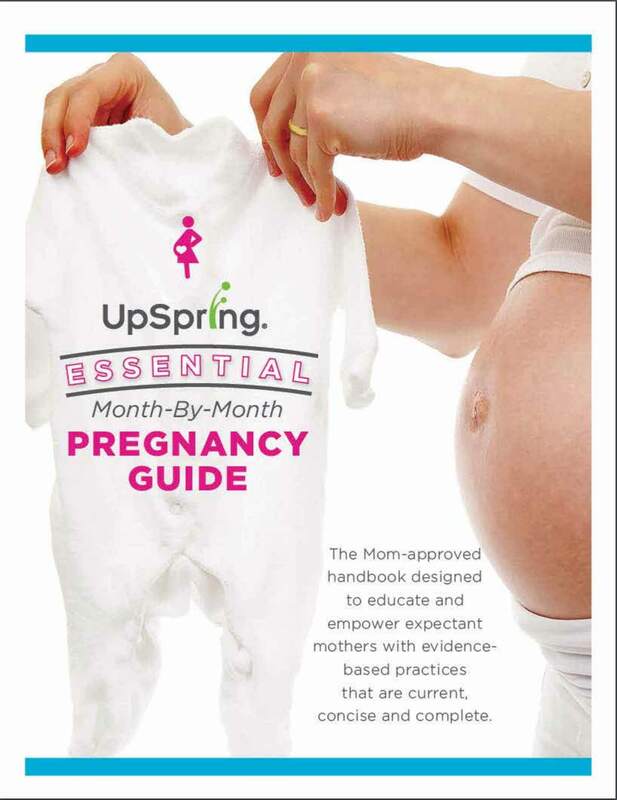 Look for UpSpring’s convenient Probiotic Drops for Baby and our other great products on Amazon or our Online Store. Click here to ease your baby’s transition to solid baby food! Congratulations! You and your little one are now almost past the colicky baby stage . It’s at this time, when your baby is about 4-6 months that many parents start introducing solid baby food and many times the babies’ first food is a pureed fruit or vegetable. At 4-6 months, babies have started showing their personalities, are moving more and it’s this baby milestone of introducing solids that can be a daunting time to see how your baby’s digestion will handle other nutrition besides breast milk or formula. Before delving into how to introduce solids to your baby, let’s first review one thing that has been shown to improve digestive health, giving your baby the best probiotic. There’s been a lot of research done on a particular strain of probiotic, Lactobacillus rhamnosus, which is why you should look for a probiotic for your baby that has this strain. It is the most clinically studied strain of probiotic and has continuously been shown to improve good bacteria in baby’s digestive system while also improving digestive comfort. Fun tip: it’s a probiotic for baby that helps promote soft stools, which will become even more important as every new baby food you introduce could cause upset tummy and tough stools. It’s advised that when introducing solids to your baby, you should only introduce one at a time. However, even when you add just one new kind of baby food to your little one’s diet, you run the risk that baby tummy troubles like gas, constipation and other gut health issues will arise. That’s why it’s also considered a good time to be diligent about giving your baby probiotic drops. All babies development will be at different paces. It’s important to keep this in mind when you begin to compare your baby’s milestones to your neighbors’ or friends’ baby. Outside of a medical condition, most babies will let you know when it’s time to start them on solids. Breast milk or formula should not be replaced completely by baby food, not yet. Typically, babies will remain on breast milk or formula until 12 months or older. It’s at this time when many parents choose to switch them over to cow, goat or nut milks. How often and how much baby food you feed your baby will depend on their age, digestive health, appetite and the baby’s cues. In general, start off with one or two foods the first couple of months and then slowly add one or two more every month thereafter. A balanced digestive system will be beneficial to your baby. As their gut health improves, symptoms like gas, constipation, tummy troubles and other issues become lessened, in one study the babies given a probiotic were less fussy by more than 50%. This will especially become evident as new baby foods are introduced to their diet. If you notice your baby gets fussy when introducing solids, try adding the best probiotic for babies to their bottle or water cup. Your baby might refuse all or most baby food, but don’t get discouraged! As long as your little one continues to grow and gain weight, you have nothing to worry about. Remember that introducing solids in the first year is only meant to supplement breast milk or formula and not to worry if it takes several months for your baby to warm up to various types of baby food. Their sibling has a known food allergy this may be hereditary and you will want to proceed with caution if/when you introduce these same foods to your baby. You’ve had your baby tested for food allergies and they came back positive for a certain food. There are so many things we take for granted and it’s fun to discover life a-new as your baby experiences things for the first time. One of the many experiences in your baby’s first year of life is beginning to eat baby food, but which one do you start with? We’ll break down your baby’s first foods into stages. This is based on texture, taste and digestibility. Keep in mind that when you first start introducing baby food, you’ll want to breastfeed or feed formula first before giving them bites of food. This will ensure for the smoothest transition from breast milk or formula to baby food. As we’ve mentioned before, please ask your pediatrician if you have any concerns or additional questions regarding your baby’s specific health. These food stages are meant to be pureed and require no chewing which also minimizes the risk of choking. The goal of this first stage is to introduce your baby to new tastes and textures. It is best to keep this to one fruit or vegetable at a time. This will allow you to see how they react and cut down on any food allergies that may arise. The goal of this stage is to begin mixing flavors. Since you’ve been slowly adding one fruit or vegetable at a time, you’ve been able to judge your baby’s reaction and ensure they haven’t had any adverse effects. The goal of this stage is to continue adding new flavors to your baby’s diet. It’s at this stage that we’ll begin mixing 3 and more things together, creating mini, pureed meals! It’s at this stage that you may want to introduce protein like various types of meats. Keep in mind that the same rule applies and you’ll want to introduce them slowly to observe how your baby reacts. If at any time you find your little one having tummy troubles like gas or constipation, consider adding a probiotic to their diet. The UpSpring Probiotic+Colostrum powder is especially helpful as it is flavorless and the added benefit of colostrum has been shown to help with leaky gut and a host of other gut health issues. This can be especially helpful when introducing meats, as your baby’s digestive system will need to produce more enzymes to digest this more complicated food type. Happy feeding! Please comment below with your favorite baby food recipes! Check out the great infographic our friends over at Momtastic have created a helpful chart to show you which foods are easiest on your baby’s digestive system and are the best first foods. Have a toddler with tummy troubles? Help them stay healthy and consider adding the Upspring Probiotic+Colostrum to your toddler or school-aged child’s diet. Also available at Target and Walgreens nationwide. *These statements have not been evaluated by the Food and Drug Administration. This product is not intended to diagnose, treat, cure, or prevent any disease. Try a sample of Probiotic + Colostrum for only $0.99 + FREE SHIPPING!